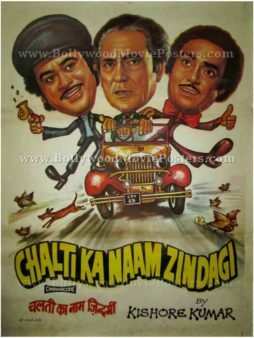 Vintage Bollywood poster for sale of the classic Hindi film Chalti Ka Naam Zindagi (1982). 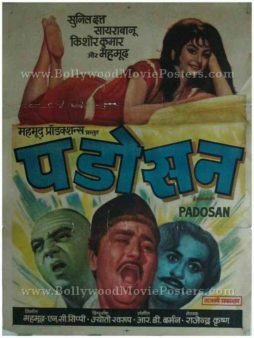 This is an actual surviving vintage Indian film poster for sale of the 1982 Hindi movie produced by Kishore Kumar that starred him in the lead role along with Ashok Kumar, Anoop Kumar, Pradeep Kumar and Nirupa Roy. 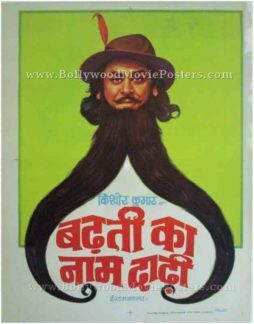 Printed and circulated during the original first release run of the film (somewhere in the early 1980s), this vintage Hindi film poster for sale was designed for publicity of the film but never ended up being used. This vintage Bollywood poster was originally hand painted on canvas by a leading poster design studio in Bombay called Studio Link. The three lead actors Kishore Kumar, Ashok Kumar and Pradeep Kumar are seen in a hilarious caricature rendition in this vintage Bollywood poster. They are seen riding in a vintage classic car. The Bollywood poster artist has chosen a caricature theme in the design of the poster in line with the humorous plot of the film. Title of the film is seen at the bottom of this vintage Bollywood poster in stunning yellow typography. Black and white old Bollywood movie stills of the Hindi film, Bhagam Bhag (1956) for sale. This is an actual surviving set of old Bollywood lobby cards of the 1956 Hindi film that starred the most successful playback singer in Indian cinema, Kishore Kumar in the lead role. 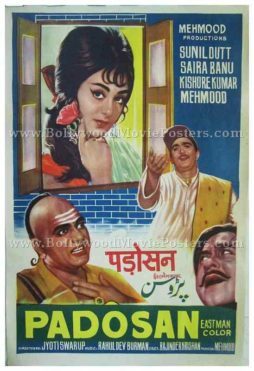 Featured here for sale is a rare surviving set of Bollywood movie lobby cards of the film Bhagam Bhag (1956) comprising a total of 15 old Bollywood movie stills! 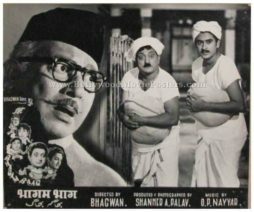 Printed and circulated during the original first release of the film (mid 1950s), these old Bollywood black and white pictures were printed for publicity of the film inside a cinema hall. This beautiful vintage set comprising 15 old Bollywood movie stills was designed and printed for publicity of the film and was actually used inside a theater that screened the film Bhagam Bhag. The corners of each lobby card display visible pin hole markings – tell tale signs of being pinned on the notice board of a movie theater. Original old hand painted Bollywood movie poster of the Hindi film Pyar Kiye Jaa (1966) for sale. This is an actual surviving vintage Bollywood poster of the 1966 romantic comedy that starred Shashi Kapoor and Mumtaz in prominent roles. 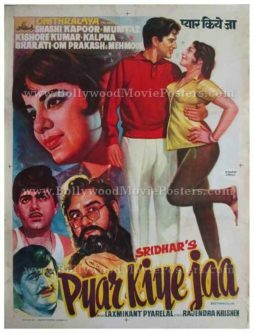 Pyar Kiye Jaa also featured the most successful playback singer in Bollywood Kishore Kumar in a supporting role, making this old Bollywood poster highly collectible! Printed and circulated during the original first release of the film in the 1960s, this old hand painted Bollywood poster was printed for publicity of the film but never ended up being used. This vintage Bollywood poster was originally designed on a hand painted canvas by artist Manohar Suresh and bears his printed signature on the center right hand corner of the poster. A fabulous side profile of Mumtaz is seen on the left of the poster, while a full length portrait of actor Shashi Kapoor appears on the right. Smaller hand painted portraits of comedians Kishore Kumar (who is seen wearing a beard), Mehmood and Om Prakash are seen at the bottom. This beautiful hand painted vintage Bollywood poster has been graded as ★★★ Average due to the presence of visible water stains (as seen in the photograph). Pyar Kiye Jaa is a 1966 Bollywood movie directed by C. V. Sridhar starring Kishore Kumar, Shashi Kapoor, Mehmood, Om Prakash, Mumtaz, Kalpana and Rajasree.